What makes Bellevue the proverbial Belle Of The Ball? Keep reading, because today, we’re going to dig into some of the factors that make this town one of the most desirable places to reside in the entire country. Few areas can rival the majesty of the Pacific Northwest, and Bellevue takes all of its most distinct visual qualities and distills them into one town. As one versed in foreign languages might well note, the name “Bellevue,” quite literally means “beautiful view” in French. There are no fewer than fifteen spots tagged on Foursquare with scenic views around the city, and some definite stand outs that top the list. It lies between Lake Washington to the west and Lake Sammamish to the east. Cougar Mountain, and a number of other cities in the Seattle area are all located nearby, which lends to another point -- Bellevue is near Seattle without actually being Seattle. It’s smaller, in the vein of a satellite city or edge city, but contains many of the positive qualities people attribute to its nearby neighbor: there are thriving companies, a decent tech boom, steady per capita income, and a way of life many other locales can only hope to imitate. 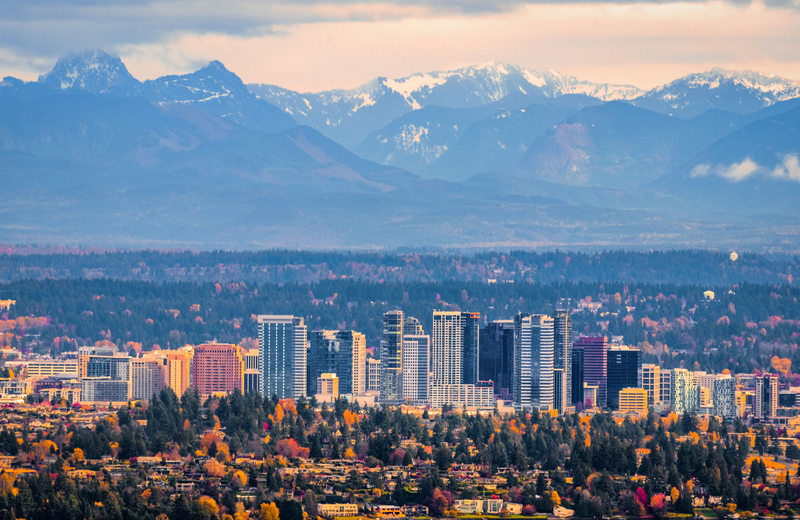 Beyond that, though, what might be the jewel on Bellevue’s crown is the backdrop of the Cascade mountain range. Part of the Pacific Ocean’s Ring Of Fire, these majestic peaks cradle the area, giving the avid outdoors-oriented individual the impression they seek: that they are intimately connected to nature, even as they reside in an area that’s a touch more urban. And this goes beyond the outdoor activities. Within the city, there are plenty of festivals, dining, arts, and culture to enjoy, with something, it seems, for just about everybody. On the event front, you might decide to head to Kelsey Creek Farm Park for the agricultural fairs that occur every spring and fall, or the annual Strawberry Festival in June (who doesn’t love strawberries?) or maybe just to tour the premises. You could learn about the area’s history at the History Of Eastside Logging event, hosted by the Eastside Heritage Center, or you might even catch a Gallery Artist’s Show, which take place at various times throughout the year. Speaking of art and culture, though, Bellevue has more than its fair share. The bustling arts scene is home to photography, sculpture, paintings, and performances of all stripes. You can tour the Bellevue Arts Museum to see some of the grand works on display, you might enjoy some of the art that’s in the public spaces around town, or even at a private gallery. If you enjoy dance and theater, the Theatre at Meydenbauer Center is the perfect location for you to catch a show, and the Resonance At Soma Towers will be your connection when you want to see talented musicians show off their craft. If you’re all about the outdoors, though, Bellevue definitely has you covered. The lakes provide plenty of room for boating and fishing, you can kayak through Mercer Nature Park, climb the mountains, play a few rounds of golf at the Bellevue Municipal Golf Course, or even stroll the Botanical Gardens. That last option is quite popular, as the garden has some 300,000 visitors every year, who go there to enjoy the quiet, see some impressive plant life, and perhaps even take a serene guided tour as they learn about the flora that Washington has to offer. Beyond that, the Chamber Of Commerce has initiated steps, like the Business Acceleration Program, to help fledgling companies get on the right track and grow their ideas with the latest in marketing and promotional techniques. By fostering local talent, it flourishes, something that Bellevue has proven works. This booming town attracts people from many walks of life, but the thing they have in common is that they need a great place to live to do their best. Hyde Square provides one such option, with a luxurious edifice, spacious residences, and a way of life that enhances the spirits of those who live here.